Double chocolate coconut cupcakes are moist, dark chocolate cupcakes, topped with a white chocolate and coconut buttercream frosting. They’re a decadent dessert that you’ll love to spoil yourself with! Disclaimer: Green & Black’s provided me with chocolate to make this recipe. Opinions and chocolate love are 100% my own. As the weather grows cooler, the cravings start to change. No longer do I want cold smoothies in the morning, but espresso shots with hot chocolate; no need for salad when I can have warm soups and grains; and definitely desserts go from fresh fruit tarts to rich, dense chocolate-inspired treats like these double chocolate coconut cupcakes. I don’t even think they should be called cupcakes, because they’re more like decadent brownie bites. The addition of both powdered cocoa and a melted Green & Black’s Baking Bar (72%) make these the perfect fall dessert. The baking bar is not only 72% cocoa content, but the extra cocoa butter added makes it much easier to melt. This would be a great chocolate to use for dipping and tempering, too, since the extra cocoa butter would allow for an easier and smoother process. To take it to the next level, the frosting on these double chocolate coconut cupcakes is coconut flavored. To make it, I used Green & Black’s white chocolate bar, which are infused with Madagascar vanilla beans! You can visually experience the vanilla specks, and the smell is lusciously sweet! Food for Thought: Here’s the thing about white chocolate – it’s not REALLY chocolate. Well, that is until 2004, when you couldn’t legally label it white chocolate. Now, all white chocolates are required to contain at least 20% cocoa butter, 14% milk solids, 3.5 percent butterfat, and no more then 55% sugar. With all these requirements, the FDA now accepts the name “white chocolate”. And damn good white chocolate it is, by Green & Black’s! 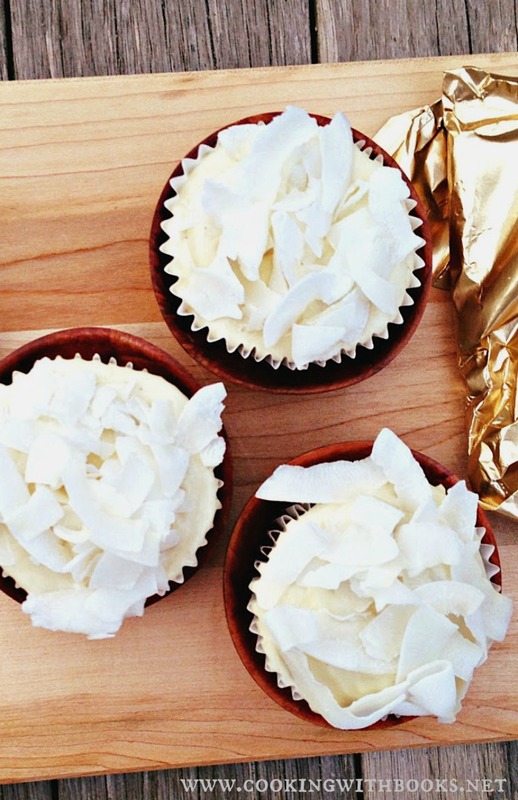 Melted into the frosting, it’s the perfect pairing to the sweet, tropical coconut flakes. Make sure you use large flakes, unsweetened. These were the ones I used in the recipe. And remember! Let the white chocolate cool before adding to the butter-based frosting. I was a bit impatient and drizzled it in while still warm, thus my frosting melted a little. Still fine to use, but not as fluffy as I’d want it to be. Now go get in the kitchen, grab your baking supply and a few Green & Black’s bars, and start your baking engines! I hope you enjoy these double chocolate coconut cupcakes. Here’s the recipe. In a mixer, stir together the butter, sugar, flour, cocoa powder, and baking powder. Whisk together the egg and milk and slowly drizzle into dry ingredients. Do not overmix. In the meantime, melt the dark baking chocolate. Stir and let cool. Drizzle and fold into cake batter. Scoop into lined muffin tins and bake until done - springy to the touch. Let cool before frosting. To make frosting, whisk butter and sugar until creamy. Drizzle in coconut milk slowly. Follow by adding melted COOLED white chocolate. Whisk until fluffy. Decorate cupcakes and top with coconut flakes. These were also filled with passion fruit curd made in Hawaii by Paradise Sweets. I find that using an apple corer to scoop out the center of the cupcakes works well. These look so yummy! A few years back you submitted a photo to green and black and it looked to me like a brownie muffin sandwich with cream or marshmallow, rolled in toasted coconut. It looked just perfect and I want to try it! <3 Green & Black’s! I also adore chocolate and coconut together, yummo! I nearly died drooling over this post. You described the chocolate so well, I can’t wait to try out this recipe. Thanks for the helpful info. And oh those vanilla specks, how I love those and the aroma of fresh vanilla — it’s irresistable! Forgive me for rambling on, this is what your post just did to me– paralyzed me with desire for choco cupcakes right now! Must try this soon. Thanks for sharing, dear!